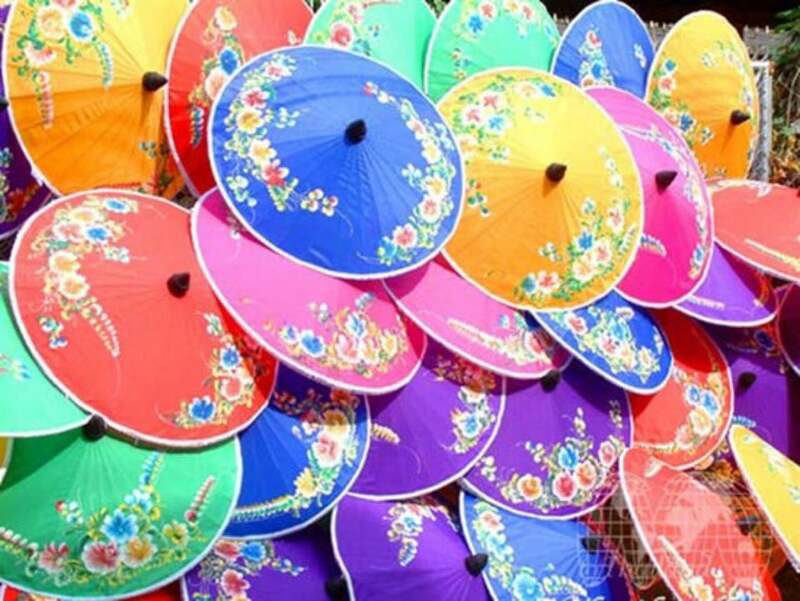 Bo Sang, a village in San Kamphaeng, is known for its handmade umbrellas and parasols, which are brightly coloured, and often decorated with floral motifs. Why Bor Sang Umbrella Village is special ? 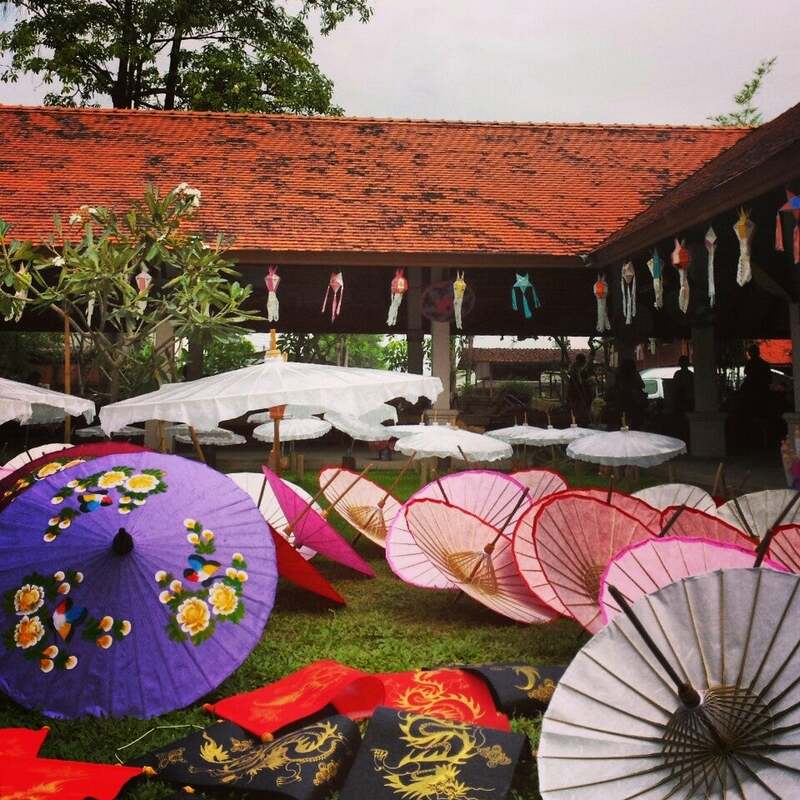 Bo Sang Village – also called the Umbrella Village, a short 9 km drive from Chiang Mai, welcomes families to watch their arts in action. The origins of the Bor Sang umbrella craft are rather ambiguous, but all stories seem to point to a pilgrim monk who stopped by to practice mindful meditation in the village. Then the stories diverge, as to whether he or an elderly local introduced the craft to the villagers. In the early days, villagers would make umbrellas during non-harvest seasons. Various umbrella parts would be fashioned out of natural products – bamboo strips for the ribs, soft wood for the cap and handle, natural latex for the varnish and sa paper for the ‘sail’. All the patterns were drawn using natural colours derived from tree barks and plants. Now acrylic paint is more common. What to explore at Bor Sang Umbrella Village? After entering the San Kampaeng district (where Bor Sang is located), you will see vibrantly coloured paper umbrellas in various street-side shops. Some also sell the umbrellas, but that’s not where all the action is. Bor Sang Village is where you want to go. Besides crafts shops, selling the umbrellas and sa paper products, the main highlight is the umbrella factory, where you can watch the craftsmen and women putting together the umbrellas from scratch. In an assembly-line setup, you will be able to tour all the stations, from the making of the smallest parts to fully assembled parts, the drawing station, sundry station (a green lawn laden with vibrantly coloured umbrellas of all sizes) and the finished product ready to be displayed in craft shops. During the annual Bor Sang Umbrella Festival (every third Friday of January), the entire village and San Kampaeng district come to live with festivities, among them parades, exhibitions and Miss Bor Sang pageant contest. How to get to Bor Sang Umbrella Village? Bo Sang Umbrella Village is located 9 km outside Chiang Mai on Route 1006 (San Kamphaeng Road). It’s very well known locally and reached in about 20 minutes by songthaew (the covered pick-up trucks that act as taxis in Chiang Ma) or by tuk-tuk (Thailand’s famous open-air “taxis”). Prices are extremely reasonable and are negotiated with the particular artist, don't be stingy with your money as you will be very proud to show off the beautiful finished product. 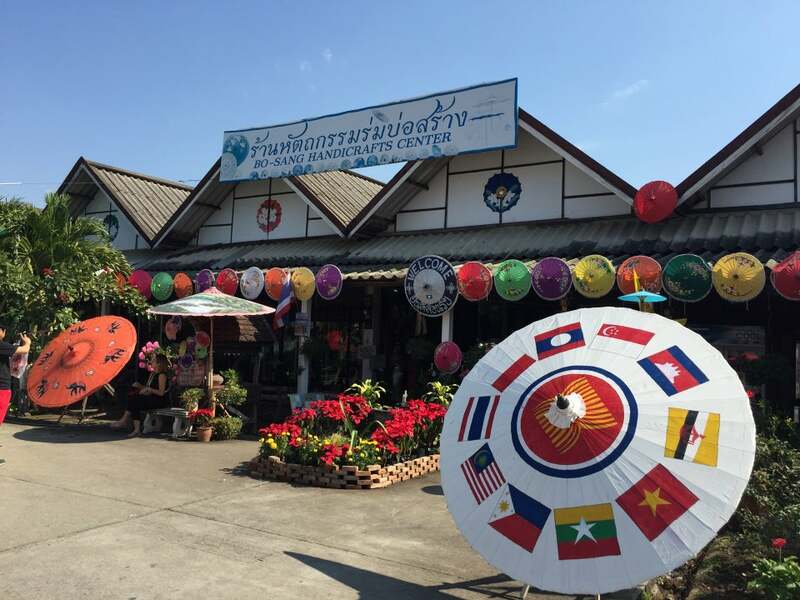 There is a large shop attached to the Bo Sang Handicraft Centre which sells a huge variety of exquisitely painted umbrellas and parasols along with other locally made handicraft products. You can also pair your Bo Sang trip with a visit to the San Kamphaeng Village, a cotton and silk weaving village just 4 km further down the road. If you don't have room in your luggage to fit all your purchases, the centre can easily arrange to post the goods overseas to your home for you. The Umbrella Village is more than just umbrellas. This is a village of artisans where you can see umbrellas being make from wooden sticks to hand-painted handmade paper coverings. Everything is done by hand with great skill. In addition to umbrellas there are artists painting scenes of Thailand on everything from cell phone cases to t-shirts to anything you may like. It is amazing to see how quickly they create their colorful art. There is a gift shop with lots of crafts, not just umbrellas, for sale. This artist community is a short trip outside Chiang Mai and definitely worth the trip.